The METTERS 'K' pattern windmill was first sold in 1934. It was however, quite a different windmill then, to the windmill which most people know by that name. Externally it was very similar, except that 5 & 6 ft models, which were built on the same gearbox, used a wind wheel blade which had the outer ring going through a slit in the blade. Internally there was one very significant difference. Instead of the guide loop shown on the display model, a single guide rod was used. 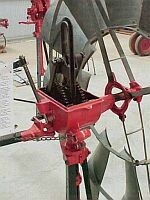 A quirk of the two smallest models is that because they inherited the hub and wind wheel from the METTERS MINOR windmill, they operated in an anti-clockwise direction, whereas the 8 and 10 foot models which used the windwheel from the NUOIL windmill, turned clockwise. In 1937 a series of fairly major changes were made to the tail hanger pin, and a roller and guide was added along with other changes to the tower fittings etc. All changed parts from this period were marked with a 'KA' prefix. Later still further changes were made, and 'KH' parts were marked from this period. In about 1958, METTERS LTD in WA announced that they were releasing the 'M' pattern and when head office were notified, they, after trying to take over the 'M' pattern, released their own version the 'KM'. This however is not really a 'K' pattern style of design, but was in reality the 'M' with a few changes. Here it is important to note that for many years the two centres appeared to run separately and had their own ideas. A point to note is that Adelaide used 'T' bar roller guides and Perth used round bar guides. The model that is on display in the museum has an orange tail, which was a colour scheme used circa 1939, before yellow became the standard colour. Over the years, several blade patterns were used on the 'K' model and the displayed unit has sections from a selection of these in the windwheel. The 'K' model was available with either galvanised or painted, tail and windwheel spokes and rings, until 1958 when production of the model ended.